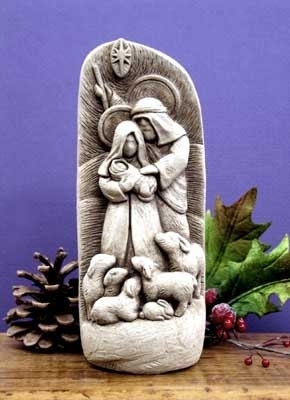 Starlight Nativity Aged Hand Cast Stone Made in U.S.A.
Home > Nativities Sets > USA Nativities > Starlight Nativity Aged Hand Cast Stone Made in U.S.A. This Holy Family Nativity is new for 2012. What a special addition to your collection, or to start a new one. These heirlooms can be handed down to the next generation or given as special gifts. Set on a table or mantle and surround with greenery, candles, Christmas cards, or feature by itself. The Aged Stone Patina on this nativity is on a natural stone base to replicate soft brown earth tones. Aged Stone is a custom color, so please expect a longer shipping time frame, up to 14 days. O' Holy Night Nativity Scene Made in U.S.A.
Away in the Manger Nativity Scene Hand Cast Stone Made in U.S.A. In stock, ships within 1-3 business days. Nativity Cross Hand Cast Stone Made in U.S.A.